During these months, your child sometimes may seem like two separate babies. First there’s the one who’s open, affectionate, and outgoing with you. But then there’s another who’s anxious, clinging, and easily frightened around unfamiliar people or objects. Some people may tell you that your child is fearful or shy because you’re “spoiling” her, but don’t believe it. Her widely diverse behavior patterns aren’t caused by you or your parenting style; they occur because she’s now, for the first time, able to tell the difference between familiar and unfamiliar situations. If anything, the predictable anxieties of this period are evidence of her healthy relationship with you. Anxiety around strangers is usually one of the first emotional milestones your baby will reach. You may think something is wrong when this child of yours who, at the age of three months, interacted calmly with people she didn’t know is now beginning to tense up when strangers come too close. This is normal for this age, and you need not worry. Even relatives and frequent babysitters with whom your baby was once comfortable may prompt her to hide or cry now, especially if they approach her hastily. At about the same time, she’ll become much more “clutchy” about leaving you. This is the start of separation anxiety. Just as she’s starting to realize that each object is unique and permanent, she’ll also discover that there’s only one of you. When you’re out of her sight, she’ll know you’re somewhere, but not with her, and this will cause her great distress. She’ll have so little sense of time that she won’t know when—or even whether—you’ll be coming back. Once she gets a little older, her memory of past experiences with you will comfort her when you’re gone, and she’ll be able to anticipate a reunion. But for now she’s only aware of the present, so every time you leave her sight—even to go to the next room—she’ll fuss and cry. When you leave her with someone else, she may scream as though her heart will break. At bedtime, she’ll refuse to leave you to go to sleep, and then she may wake up searching for you in the middle of the night. How long should you expect this separation anxiety to last? It usually peaks between ten and eighteen months and then fades during the last half of the second year. In some ways, this phase of your child’s emotional development will be especially tender for both of you, while in others, it will be painful. After all, her desire to be with you is a sign of her attachment to her first and greatest love—namely you. The intensity of her feeling as she hurtles into your arms is irresistible, especially when you realize that no one—including your child herself—will ever again think you are quite as perfect as she does at this age. On the other hand, you may feel suffocated by her constant clinging, while experiencing guilt whenever you leave her crying for you. Fortunately, this emotional roller coaster eventually will subside along with her separation anxiety. But in the meantime, try to downplay your leave-taking as much as possible. Here are some suggestions that may help. Your baby is more susceptible to separation anxiety when she’s tired, hungry, or sick. If you know you’re going to go out, schedule your departure so that it occurs after she’s napped and eaten. And try to stay with her as much as possible when she’s sick. Don’t make a fuss over your leaving. Instead, have the person staying with her create a distraction (a new toy, a visit to the mirror, a bath). Then say goodbye and slip away quickly. Help her learn to cope with separation through short practice sessions at home. Separation will be easier on her when she initiates it, so when she crawls to another room (one that’s babyproofed), don’t follow her right away; wait for one or two minutes. When you have to go to another room for a few seconds, tell her where you’re going and that you’ll return. If she fusses, call to her instead of running back. Gradually she’ll learn that nothing terrible happens when you’re gone and, just as important, that you always come back when you say you will. If your child has a strong, healthy attachment to you, her separation anxiety probably will occur earlier than in other babies, and she’ll pass through it more quickly. Instead of resenting her possessiveness during these months, maintain as much warmth and good humor as you can. Through your actions, you’re showing her how to express and return love. This is the emotional base she’ll rely on in years to come. From the beginning, you’ve considered your baby to be a unique person with specific character traits and preferences. She, however, has had only a dim notion of herself as a person separate from you. Now her sense of identity is coming into bloom. As she develops a growing sense of herself as an individual, she’ll also become increasingly conscious of you as a separate person. One of the clearest signs of her own self-awareness is the way your baby watches herself in the mirror at this age. Up to about eight months, she treated the mirror as just another fascinating object. Perhaps, she thought, the reflection was another baby, or maybe it was a magical surface of lights and shadows. But now her responses will change, indicating she understands that one of the images belongs to her. While watching the mirror, for example, she may touch a smudge on her own nose or pull on a stray lock of her hair. You can reinforce her sense of identity by playing mirror games. When you’re looking in the mirror together, touch different body parts: “This is Jenny’s nose. This is Mommy’s nose.” Or move in and out of the mirror, playing peekaboo with the reflections. Or make faces and verbally label the emotions you are conveying. As the months pass and your child’s self-concept becomes more secure, she’ll have less trouble meeting strangers and separating from you. She’ll also become more assertive. Before, you could count on her to be relatively compliant as long as she was comfortable. But now, more often than not, she’ll want things her own particular way. For instance, don’t be surprised if she turns up her nose at certain foods or objects when you place them in front of her. Also, as she becomes more mobile, you’ll find yourself frequently saying “no,” to warn her away from things she shouldn’t touch. But even after she understands the word, she may touch anyway. Just wait—this is only a forerunner of power struggles to come. 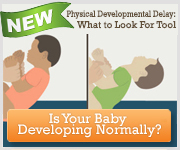 Your baby also may become afraid of objects and situations that she used to take in stride. At this age, fears of the dark, thunder, and loud appliances such as vacuum cleaners are common. Later you’ll be able to subdue these fears by talking about them, but for now, the only solution is to eliminate the source of the fears as much as possible: Put a night-light in her room, or vacuum when she’s not around. And when you can’t shield her from something that frightens her, try to anticipate her reaction and be close by so she can turn to you. Comfort her, but stay calm so she understands that you are not afraid. If you reassure her every time she hears a clap of thunder or the roar of a jet overhead, her fear gradually will subside until all she has to do is look at you to feel safe.